As technological advances allow for the identification of tumor-associated antigens (TAAs) against which adaptive immune responses can be raised, efforts to develop vaccines for the treatment of cancer continue to gain momentum. Some of these vaccines target differentiation antigens that are expressed by tumors derived from one particular tissue (e. g., Melan-A/ MART-1, tyrosinase, gp 100). Some target antigens are specificallyexpressed in tumors of different types but not in normal tissues (e. g., MAGE-3), while other possible targets are antigens that are expressed at low level in normal tissues and are over-expressed in tumors of different types (e. g., HER2, Muc 1). Oncogenes (HER2/neu, Ras, E7 HPV 16), tumor suppressor genes (pS3) or tumor-specific post-translational modified proteins (underglycosylated Muc 1) can also be used as cancer vaccine candidates. In either case, these antigens tend to be poorly inmmunogenic by themselves and vaccines containingthem generally require the inclusion of potent immunological adjuvants in order to generate robust anti-tumor immune responses in humans. Many adjuvants currently under evaluation for use in cancer vaccines activate relevant antigen presenting cells, such as dendritic cells and macrophages, via toll-like receptors (TLRs) and promote effective uptake, processing and presentation of antigen to T-cells in draining lymph nodes. Lipid A, the biologically active portion of the gram-negative bacterial cell wall constituent lipopolysaccharide (LPS), is known to possess strong immunostimulatory properties and has been evaluated for more than two decades as an adjuvant for promoting immune responses to minimally immunogenic antigens, including TAAs. The relatively recent discovery of TLRs and the identification of TLR4 as the signaling receptor for lipid A have allowed for a better understanding of how this immunostimulant functions with regard to induction of innate and adaptive immune responses. 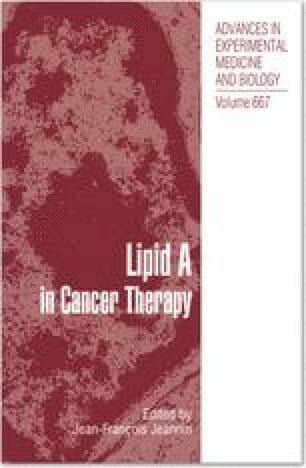 In this chapter, published clinical trials conducted to evaluate the safety and/or efficacy of various cancer vaccines containingMPL, either alone or combined with other immunostimulants, Such as cell wall skeleton (CWS) of Mycobacterium phlei in the adjuvant Detox™; Biomira, Inc.), the saponin QS-21 (in the adjuvants AS01B and AS02B; GSK Biologicals) or with QS-21 and CpG oligonucleotides (in the adjuvant AS15; GSK Biologicals) will be summarized. Combining MPL with other immunostimulants has been demonstrated to be advantageous in many cases and may be required to elicit the full complement of activities necessary to achieve an effective immune response and overcome the ability of tumors to evade attack by the immune system. In this chapter, information relating to vaccines targeting specific cancers will be presented in the first section, while information relating to vaccines targeting multiple tumor types by the induction of immune responses to shared TAAs is presented in the second section.